In this first one, the Leadership/Management mode, those who are leading are basically the ones setting the strategy and then take steps to roll out that strategy. That’s what defines leadership here at the Manager by Designsm blog. But what happens if you don’t have leaders who do this? If that’s the case, they are doing something else. They are in a “leadership position” but are not leading. So what are they doing? They basically are giving themselves a “demotion” to that of manager, where the main job of the manager is strategy execution. But wait – how can you be doing strategy execution when there is no strategy? In this dynamic, we have people who are supposed to be doing strategy, but are instead doing strategy execution without strategy. It’s a logical impossibility, but one that we see play out in organizations from time to time. In this dynamic, you have a false premise that, by virtue of people being in a leadership role, being in a leadership role equals doing leadership, when it is often the case quite the opposite. Someone in a leadership role not doing leadership, but doing something else under the guise of leadership. Do this enough, and one starts to believe that this “something else” is leadership – the something else of not doing leadership. That something else — that “thing-other-than-leadership” is managing, and to be more precise, it’s managing without a strategy. By focusing on “strategy articulated” and “no strategy articulated” axis, this puts the burden on whether Leadership has done its job and continues to do its job. 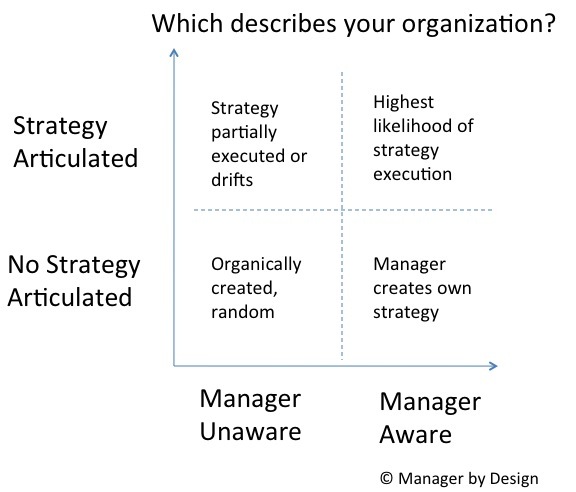 If there is no strategy articulated, then the organization is automatically relegated to the bottom two quadrants, where either the strategy is created by random pockets within the organization, or it is created by the managers. Amazon.com WidgetsBut in the dynamic where “leadership” is not articulating the strategy — and this can also mean re-articulating and reinforcing the strategy — you have both the leadership and management creating a strategy. Under this dynamic, the strategy is most likely a mishmash of events, sudden reactions to outside forces, frequent crises and ideas that emerge and disappear. It isn’t clear where the strategy is or what the “real” strategy is. So the longer this dynamic plays out, the more the organization’s strategy will drift to the lower left corner – an organically created, random strategy of mysterious origin and of ever changing nature. Strategy as entropy. But on top of that, now you have multiplied the number of managers – both the leadership team and the management team are doing the same job – entropic strategy execution. The Manager by Designsm blog’s mission is to identify how to systematically design-in great management. One way to do this is to have great leadership, and the bar I’m setting for great leadership is to have a consistent strategy that is well articulated and reinforced, so the managers can then execute on it. 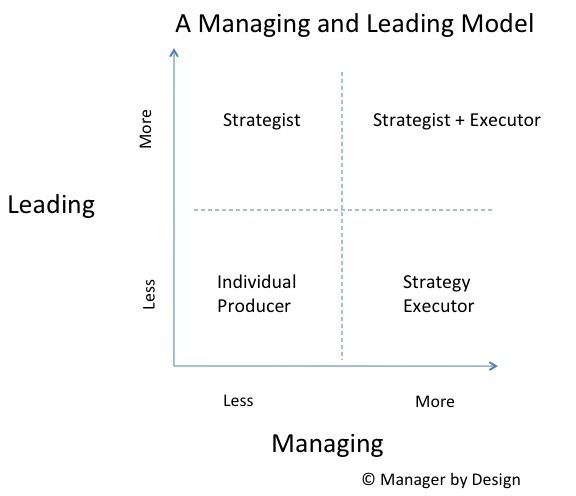 Now, in many organizations the managers and the leaders are often the same people – and the first grid above shows a common design of people having to do both jobs. But that also underscores the necessity to know when one job is being done – setting and articulating the strategy – and when the other job is being done – executing the strategy. Otherwise, it’s a formula for chaos.